This weekend was the Saints and Sinners Literary Festival. I had a great time, as I was on a couple of panels and even did a reading from my latest book, Bitter Heart. 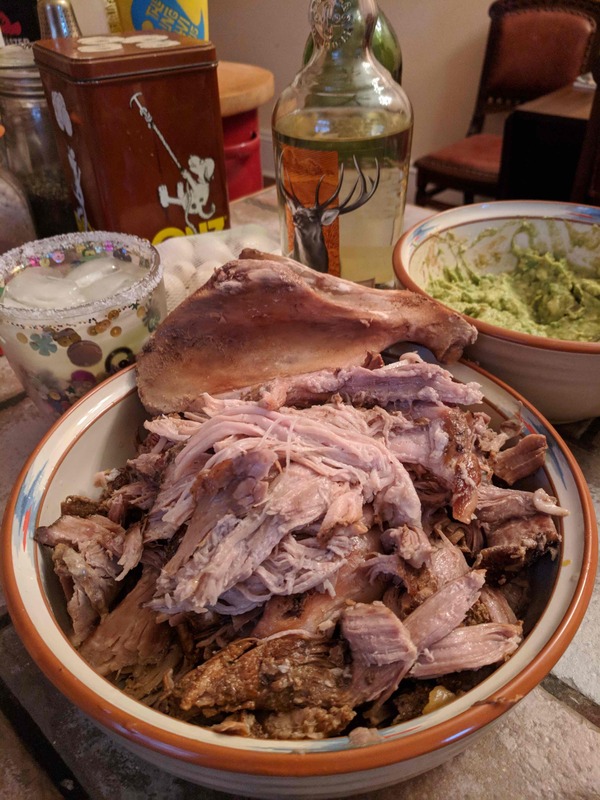 On one of the days that I knew I was going to be busy all day at the conference, I put a pork shoulder in the slow cooker with some spices and a bit of citrus juices for us to have meaty tacos for dinner and for me to have delicious leftovers. I was joined for dinner by my fellow author, Mercedes Lewis, who read from her book of poetry (Glimpses of a Fractured Soul) at Saints and Sinners and also participated on a poetry panel. Mix dry rub together and store until ready to use in an airtight container. Cut off the large fat cap and any other spots of hard fat. Rub spice mixture on the meat. Heat a skillet and brown the meat on all sides. Remove meat from the skillet and place on a bed of onions and garlic in a large crockpot. Pour the juice and stock into the skillet to deglaze the pan. Scrape up any fond on the bottom and then pour over the meat. Cover and cook on low in the slow cooker for 6 to 8 hours. Remove when the meat is falling off the bone. Let cool for 15 minutes before attempting to shred for tacos. For the tacos, I had both hard corn taco shells and soft flour tortillas, guacamole, sliced red and green bell peppers, black beans, grated pepper jack cheese and salsa to go with the shredded meat. We built our tacos based on our own taste and ended up eating more than planned as everything tasted so good. I will use the leftovers in quesadillas, burritos or even with a little BBQ sauce for a pulled pork sandwich. More blogging! Fun! And I’m so glad you enjoyed it!